Kenyan fastman David Rudisha, above, seems to be the ultimate modern speed machine—upholstered in aerodynamic, wicking fabrics, branded, nano-shod. The latest science informs his training, nutrition and recovery. A multi-time world champion and Olympic gold medalist, he's broken the world record at 800 meters three times, and owns the latest of those records—1:40.91. He travels the world and accepts awards and looks debonair in a suit. Well, you can take the man out of Maasai country but you can't take the Maasai out of the man. Rudisha told Australian newspaper The Age some details of his life in Kenya that are a world away from cufflinks and news conferences. For example, the whole warrior thing. Not to be confused with the Warrior Dash (share on Instagram! ), this is a serious rite of passage. Rudisha is Maasai, and if you're a 21-year-old guy in that group, you have to pass this test, or maybe die trying (see methods, below). Rudisha said he got comped into warrior status because he was in Europe setting a world record when the rest of his cohort was out luring and killing a lion to prove their manhood. The summer he was 21, that was 2010, he circled a track twice in 1:41.01, which almost certainly involved a horrific burning sensation in his lungs and legs for the last 200 meters. He got extra points for running bravely, leading the race wire to wire, which is 800 meters the hard way. (He did have help from his training partner and official pacemaker, Sammy Tangui, who took Rudisha through the first lap under 50 seconds, but there's nothing saying a warrior can't have help from his mates). Also, Rudisha brought a ton of honor to the Maasai by not only being a world record holder, but also being an elegant runner, and classy. Thus, the pass on actually tromping around on a grassy plain wearing a sarong and sandals, carrying a spear and looking for trouble. One of the fun and quirky things Rudisha mentioned in this interview was the way lion luring was done in 2010, which did not, as you'd assume, involve a GPS watch or texting between groups of hunters. To hunt the lion the Maasai nominate one of their hunters as a sacrifice to lure out the lion. The hunter rings a bell loudly and constantly until an irritated lion attacks. The hunting party then moves in and kills the lion. If the bell-ringer survives he is venerated as a brave and lucky warrior. Demonstrating that he is a modern man, a worldly man, Rudisha was not so much concerned about the unfortunate bell-ringer in this scenario as the unfairly harrassed and targeted lion. That is 21st century thinking. Lions are not endangered in Kenya, but it's just bad PR to annoy Simba to the point of aggression, and then kill him. Especially if you have not laid down some serious USD to a professional guide service to do so. So, inspired by the original Olympics that sought to channel warriors' skills into less lethal avenues, Rudisha spearheaded the Maasai Olympics, featuring Maasai-specific feats of running, jumping and throwing. The first Maasai Olympics was held in 2012, and the second in December 2014. There's a curious dissonance in going to their website and watching a lad hurl a femur-looking projectile at a target with the sort of accuracy that suggests everyday application (about 2:03 in the video below). 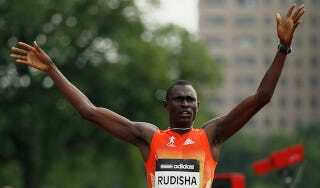 Some things, like lion-killing, may change, but Rudisha told The Age that for the Maasai, it's still all about cows. Maserati and a bespoke suit be damned, a big herd of cows talks in his neighborhood. He married his childhood sweetheart in 2010, paying her family twelve cows for the privilege. Rudisha's status as an athlete is so great, though, that he can get away with keeping only a few cows (too difficult with his training and traveling schedule) and still be respected. He's admired and decorated for his smooth, flowing running style, but the soft-spoken Rudisha has shown equal grace and skill at moving quickly between worlds. There should be a medal for that.